Explore the world-changing digital transformation in China China's Mobile Economy: Opportunities in the Largest and Fastest Information Consumption Boom is a cutting-edge text that spotlights the digital transformation in China. Organised into three major areas of the digital economy within China, this ground-breaking book explores the surge in e-commerce of consumer goods, the way in which multi-screen and mobile Internet use has increased in popularity, and the cultural emphasis on the mobile Internet as a source of lifestyle- and entertainment-based content. Targeted at the global business community, this lucid and engaging text guides business leaders, investors, investment banking professionals, corporate advisors, and consultants in grasping the challenges and opportunities created by China's emerging mobile economy, and its debut onto the global stage. Year 2014-15 marks the most important inflection point in the history of the internet in China. Almost overnight, the world s largest digitally-connected middle class went both mobile and multi-screen (smart phone, tablets, laptops and more), with huge implications for how consumers behave and what companies need to do to successfully compete. As next-generation mobile devices and services take off, China s strength in this arena will transform it from a global trend follower to a trend setter. * Understand what the digital transformation in China is, and impact on global capital markets, foreign investors, consumer companies, and the global economy as a whole * Explore the e-commerce consumption boom in the context of the Chinese market * Understand the implications of the multi-screen age and mobile Internet for China's consumers * See how mobile Internet use, its focus on lifestyle and entertainment is aligned with today's Chinese culture * Learn about the mobile entertainment habits of China s millennial generation and the corresponding new advertisement approaches The development of China s mobile economy is one of the most important trends that will reshape the future of business, technology and society both in China and the world. 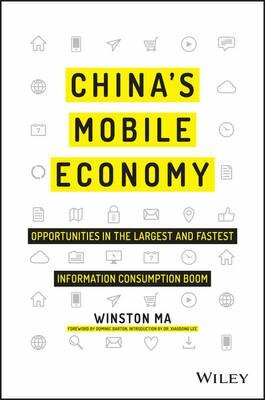 China's Mobile Economy: Opportunities in the Largest and Fastest Information Consumption Boom introduces you to the digital transformation in China, and explains how this transformation has the potential to transform both China and the global consumer landscape.